There’s a lot of store put in making the right impression. Or sometimes, just not making the wrong impression. I’m not sure which category last Saturday fell into for me. It had been an eventful week anyway with lots going on as usual, plus my father being rushed to hospital the other night (he’s making a good recovery at home now, thanks in advance for the concern). But on Saturday afternoon I seemed to make a particular impression wherever I went, condensed into a slightly frantic two hours. Just bear in mind that I was extremely tired, and apparently suddenly living the life of a 1970’s English sit-com. After a morning of kids’ clubs and dog-walking, we were just getting #3 ready to go to a friend’s birthday party when my mother rang – could I dash to the hospital quickly to pick up some new meds for my dad, following fresh blood test results. Of course – handing party duties over to SJ, I headed off unwittingly to make Impression 1. I seemed to pick the only doctor who’d gone missing in A&E and it took half an hour for two very helpful nursing staff to find him while they juggled their usual busy stuff. Queue me waiting in A&E Major Injuries, getting in the way of trollies and smiling inanely to every lovely apology I got for the missing (read: busy) doc. They quite possibly thought I was an idiot, I was grinning (perhaps gurning) so much. An hour later, errands done (involving me carrying a whole armchair upstairs at my parents house – random activity for the day), I headed off home via a service station for fuel. Grabbing some milk in the shop, I didn’t realise I was about to make a more significant Impression 2. Even as the 4-pint plastic bottle slipped from my grasp at the counter, I still thought I could catch it. It was almost only as my feet got wet that my hurried brain was prepared to accept it had hit the floor. And what a mess four pints of milk can make. It goes an awfully long way, doesn’t it? The staff were wonderful about it, and brushed off my apologies as if it really was no bother. By the time I’d also had to return to get a refund on something I hadn’t intended to buy, Impression 2 was well and truly established. Driving home, I stopped at our village butchers for (ironically) bananas. 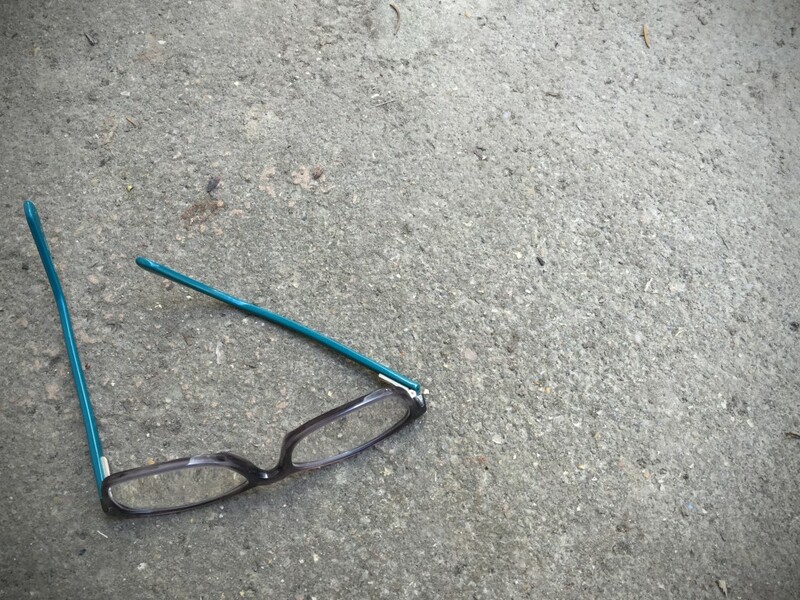 At the precise moment I was getting out the car, one of our lovely butchers came out to tell me they’d just closed – just as my foot reached the pavement, I heard a clatter and a ‘plop’, and looked down to see my glasses (which had been on my lap in the car) slip underwater in the drain at my feet. Soon I had two butchers offering me a broom handle and rubber gloves (an unusual combination, in other circumstances), and an Irish guy rooting around in his car for a crowbar. Now, my Dad’s always brought me up to be independent, and although I don’t turn down help when I really need it, I thought ‘I’ve got this one’. It’s not easy pulling up a drain grille with your bare paws, but this girl is a bit handy and before I knew it I was kneeling in the road, sleeves rolled up, rooting around in a foot of black sludge, up to my elbows in the drain (who needs rubber gloves). Glasses retrieved (and several unidentified sludgy items ignored), I cleaned up in the butchers and even bought six out-of-hours bananas (I think they felt sorry for me). Impression 3. Now, you could be forgiven for thinking that this was a bad afternoon. How we perceive good or bad luck, is often a matter of choice. So all in all, I don’t think that was a bad afternoon after all.